Plant leaves are biofactories that can accumulate valuable products in a number of discrete compartments both within and between cells. Furthermore, they also fine tune synthetic pathways in response to environmental signals. While significant progress has been made in defining cell specific gene expression in roots, this has not been achieved in leaves. This is a bottleneck in engineering this easily harvested organ, and there is no central repository of genetic modules to facilitate this. We aim to provide a library of elements that can be used to drive expression of both nuclear and plastid encoded genes in specific compartments of specific cells of leaves, and in addition to control that expression over the day-night cycle. Photosynthesis sets maximum crop yield but despite millions of years of natural selection is not optimised for either current atmospheric conditions or agricultural practices. The majority of photosynthetic organisms, including crops of global importance such as wheat, rice and potato use the C3 photosynthesis pathway in which Ribulose-Bisphosphate Carboxylase Oxygenase (RuBisCO) catalyses the primary fixation of CO2. However, carboxylation by RuBisCO is competitively inhibited by oxygen binding the active site. In some plants, evolution has led to a modified system known as the C4 pathway in which RuBisCO is limited to a specific compartment where CO2 is concentrated. In both C3 and C4 plants, leaves contain multiple distinct cell-types. However, our understanding of how gene expression is controlled in these cell-types is limited. Our aim is to provide a collection of DNA parts that allow targeted engineering of photosynthesis and other traits in specific cells of leaves. Stable transgenic lines of Arabidopsis thaliana containing epitope tagged nuclei and ribosomes driven by cell specific promoters have been produced in the Hibberd lab. These are being characterised and selfed to identify lines that can be used for isolation of RNA that is available for translation, as well as for cell specific DNaseISEQ. By interrogating these datasets, we aim to identify short DNA sequences that can be used to drive expression of genes in specific cells of the leaf to enhance photosynthetic efficiency. 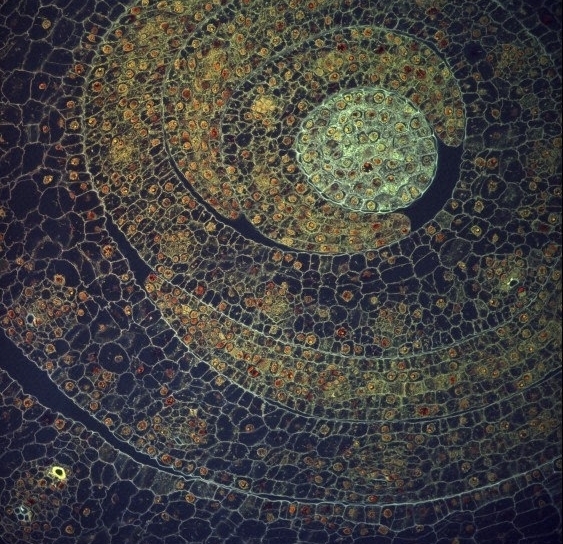 By combining RNA-SEQ datasets from defined cell-types of the Arabidopsis leaf with the transcription factor footprinting that is generated from DNaseI-SEQ, OpenPlant research aims to identify, characterise and release of a collection of transcription factors that bind defined cis-elements for engineering co-ordinated expression of synthetic pathways in leaves. Work starting in 2017 aims to characterise inducible and cell-specific plastid targeted systems for regulation of plastid gene expression for public release. Christian Boehm in the Haseloff lab has established plastid transformation in Marchantia, and developed refactored cyan fluorescent protein markers for plastid expression. The use of fluorescent protein markers in Marchantia chloroplasts has been highly problematic for a number of years. There have been no reports of their successful use for chloroplast transformation. Christian has successfully engineered the cyan fluorescent protein gene for use in chloroplast transformation experiments in Marchantia, providing a valuable tool for characterisation of regulatory elements (Boehm et al., 2016). A future OpenPlant aim toward a toolkit for engineering in leaf tissues is the development of circadian controlled synthetic promoters for expression at defined phases in the day-night cycle in plants. More information coming soon. The Hibberd lab has been developing artificial protein scaffolds from bacteria that assemble in planta for metabolic engineering in leaves. They are investigating whether these artificial protein scaffolds can be used to improve the efficiency of photosynthesis, and for the more general aim of engineering plant metabolism. They have designed and synthetised parts and modules according to the PhytoBrick standard (Patron et al., 2015), and have been tested in Arabidopsis thaliana and shown to interact via Bimolecular Fluroescence Complementation (BiFC) coupled with Confocal Laser Scanning Microscopy. Patron, N.J., Orzaez, D., Marillonnet, S., et al., 2015. Standards for plant synthetic biology: a common syntax for exchange of DNA parts. New Phytologist, 208(1), p13-19. DOI: 10.1111/nph.13532. Williams, B.P., Burgess, S.J., Reyna-Llorens, I., Knerova, J., Aubry, S., Stanley, S., and Hibberd, J.M., 2016. An Untranslated cis-Element Regulates the Accumulation of Multiple C4 Enzymes in Gynandropsis gynandra Mesophyll Cells. Plant Cell, 28(2), p454-65. DOI: 10.1105/tpc.15.00570.